Locate the town of Celano, just east of the peak and on the north side of the autostrada E-25. Take this exit and get onto Hwy. SS-696 going north. You should drive essentially to Rocca di Mezzo. Note when you exit the small hamlet of Rovere, this is the last place before your turn-off. As you are about to enter Rocca di Mezzo, in the very first traffic circle, make a sharp left, ie. go around and take the last exit before you are back on the road you came from. This traffic circle is at location N42.20079, E013.51955. Drive this nicely paved road (Via Di Pezza) until it ends at a nice overlook where you see a large, completely flat valley (good grass for animals) stretching west. From here, the road is rougher, but driveable by normal cars. Take the left fork, drive by a building, then make a sharp right in order to descend into this valley. The right fork is more direct, but that road was quite a bit rougher when I was there. Continue to follow the main dirt road that runs the full length of this flat area, ie. to its west end. There is a fallen sign that (should) tell you when to stop. Park here, this is a good trailhead, location N42.18215, E013.42804, elevation about 1540 meter. Continue along what still looks like a road a short stretch to a clear trail sign that points slightly right relative to your direction of travel. The sign says that the hiking time to Monte Velino is 4 hours and 50 minutes. A person in reasonable shape should be able to do this quite a bit faster (see below). Follow this big trail as it climbs gently among trees. It breaks out in the open near 1800 meter of elevation, there is another trail sign at this location. One may fork right and get to the Rifugio Vincenzo Sebastiani located directly north of Monte Costone. However, the signs says that one should take the left fork going to Monte Velino. The trail now climbs, quite nicely to the main crest up front. At the crest, you should fork left. You can now see Monte Velino to the south across a wide saddle connecting this first crest with your goal. Facing Monte Velino, the peak Punta Trento, 2243m, is very close up on your left hand side, while the slightly higher Monte Costone, 2271m, is located to your right. Turning right instead of left when you reached the crest would lead you to Costone. These two peaks can easily be climbed (for extra credit), perhaps best doing Punta Trento on the way to Monte Velino and Monte Costone on the way back. Descend to the broad saddle, then follow the trail as it climbs to a natural col on the main crest up in front, having Monte Velino further to the right. Ascending right, you will soon see a summit cross on a peak ahead. 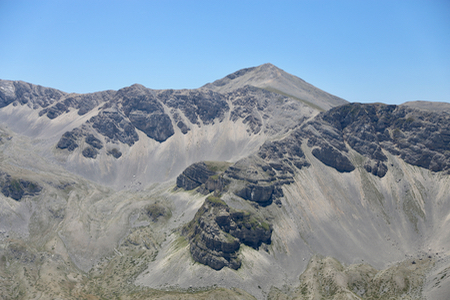 This is Monte Cafornia, 2424m, with approximately 75 meter of prominence. Turn right as you arrive at more level ground and follow the trail that now follows the ridge as it curves in order to connect with Monte Velino. The trail merges with trail number 3 (your trail has number 1), at the base of Velino. All that remains is a short climb to its summit. The summit has a cross overlooking the big valley on its south side, there is a small statue of Maria, while a concrete slab holds the highest point, this is located a few meter before you arrive at the two other summit markers.